Christopher Nolan does it again, drawing a fine line between what is real and what is simply an image of our own emotions. As a director, Nolan is one of very few who makes so many viewers question everything as the credits roll and they get into their cars to make the journey home. I was slightly apprehensive going into Interstellar, with a huge boom of hype surrounding the movie for months it was almost telling everyone how brilliant it could be without proving anything. 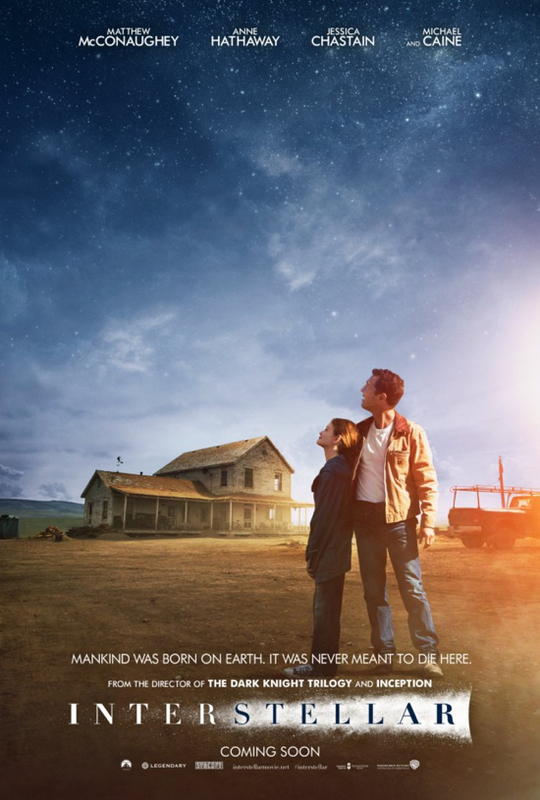 With all of Christopher Nolan’s films, he doesn’t give you the answers your looking for on a plate – that would all be too easy, and Interstellar is certainly not an exception to this rule. We learn of Cooper (Matthew McConaughey) an ex-space pilot, with two children, Tom (Timothee Chalamet) and Murph (Mackenzie Foy) – an intriguing character who is experiencing a ‘ghost’ in her bedroom. What is clever about this movie is that it never tells you what time period we’re experiencing, making it feel all too real that the planet is running out of resources and if a secret NASA mission (featuring Anne Hathaway and Michael Caine) doesn’t have success then the likelihood of the people on Earth surviving is next to none – dramatic, right? Of course it’s all a little bit more than this, and as Cooper and his crew go off to explore space, Nolan really starts to play with what we’re all familiar with – time. The way he does this is so subtle and that’s what makes it have such an impact. McConaughey is cautious to make promises to his children, but he confirms ‘I’m coming back…’, a risky promise to make when you’ve got Christopher Nolan directing you into something that says otherwise. Emotionally draining would be the wrong phrase, but Nolan does something to our emotions when time begins to lose its original state for Cooper and co, culminating in a scene where McConaughey’s children catch up the years with their father due to the difference between space and Earth – a scene where there were very few dry eyes in the screening. There’s something a bit different about Interstellar in comparison to recent sci-fi movies, it has almost everything that Gravity didn’t, but yet it’s actually so much more than a sci-fi film – space is almost irrelevant in comparison to the bigger, wider message that Nolan is trying to get across. The final sequences of the film take everything we’ve already accepted and learned over the last two hours or so and twists them into something much more – the complex idea of different dimensions is one that you don’t understand immediately, but Cooper almost guides you through the complexity at the same rate that he’s trying to understand things himself. Nolan plays with reality in a way that makes you question everything. An almost understated idea of the film rings through towards the end, the idea of this ‘fifth dimension’ representing love seems to reflect at the very end of the movie as Cooper is trapped in it himself. I couldn’t help but ask myself what would happen if we too ran out of everything and time caught up with us – a question that perhaps isn’t so far from the state of modern day. Interstellar isn’t for everyone – I wouldn’t describe it as a difficult watch but you’ve got to pay attention and be ready to question things. It leaves you wanting more – which you’ll only get from your own interpretations and answers, but I think that’s what makes it so clever. It’s the sci-fi blockbuster, that is actually a lot less about science and a lot more about humanity than we might first think. This entry was posted in Uncategorized and tagged anne hathaway, blockbuster, christopher nolan, cinema, film, film blog, film critic, film review, interstellar, matthew mcconaughey, michael caine, movie. Bookmark the permalink.